Here’s the thing, if you’ve never had a baby before, navigating the nursery design can be super confusing. Aside from making it look nice, you have to worry about getting the right products, making sure everything is safe, and figuring out where to store everything. How the heck can you even do that if you’ve never done it before? Like everyone else on the planet, most turn to internet searches for answers. But the internet is vast and overwhelming, and sometimes you never find the exact answer you need. I’ve been working with one of my nursery clients for a while and she asked me a question after her crib arrived and was assembled. I’ve never seen this question addressed anywhere else (but granted, I didn’t look that hard), so I wanted to create a post about it. She had her crib assembled with the mattress at the highest setting as I instructed her, but then noticed that there was hardware visible and a lot of empty space under the crib. As someone who’s going to give birth to a real (tiny) human being, little things like this can be scary if you don’t know what you’re dealing with. Here is all you need to know about how to assemble your crib, make sure it’s safe, and understand all those parts. All cribs manufactured in the United States are held to rigorous safety standards, so they are all more-or-less built the same way. They have a rectangular frame (although oval and round do exist), a mattress support and hardware to hold the mattress support in place. The design varies as far as legs, side panels, etc., but those are the basics. Most cribs will have multiple settings for mattress heights as well. Conversion kits will convert the crib to a toddler bed. When you’re shopping, make sure to look for that feature—a lot of times it’s sold separately. However, you don’t need this. 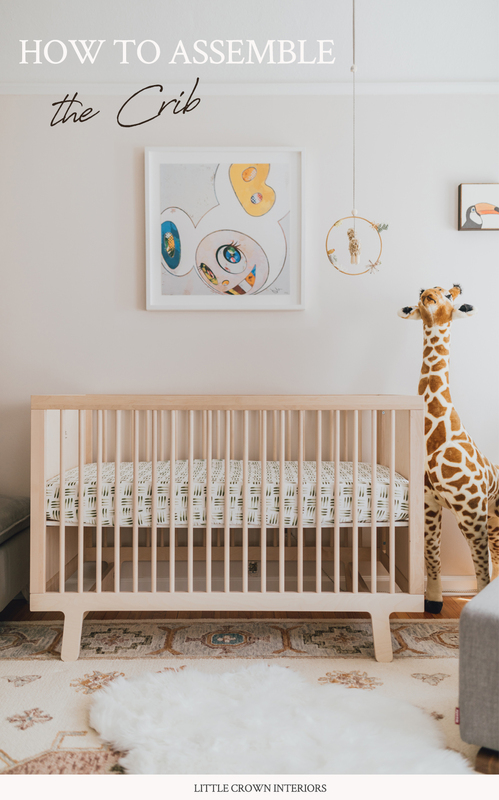 It’s handy if you love your crib and want to convert it down the line, but a lot of parents just opt to keep their child in the crib longer and then switch to a twin bed. A lot of this depends on how active your child is (i.e. if you have a climber). Always always always assemble your crib exactly according to the directions—it’s all about safety. If you have a newborn, assemble the crib with the mattress at the highest setting. This is so you don’t have to bend all the way down to pick up the baby. When your baby starts to move around or pull up, refer back to your directions to move the mattress down. Here’s where my client’s question came in. With the mattress at the highness setting, you can see through the underside of the mattress support, and can sometimes see ugly hardware. You don’t need any extra parts or box springs for this, it just looks strange. This is where crib skirts come in handy as they will sit between the support and the mattress and hang down to cover the hardware. However, depending on the design of the crib, a skirt may not fit over the hardware properly. I know, this still boggles my mind. If you Google the crib you want and can’t find any photos of it with a skirt, this might be the issue. You can always call and ask. In the pastel nursery above, there’s no ugly hardware visible, just the wood support, so no need for a crib skirt. The crib is the Oeuf Sparrow Crib, set at the top mattress setting. Thought that was cut and dry? Nope. It never is. 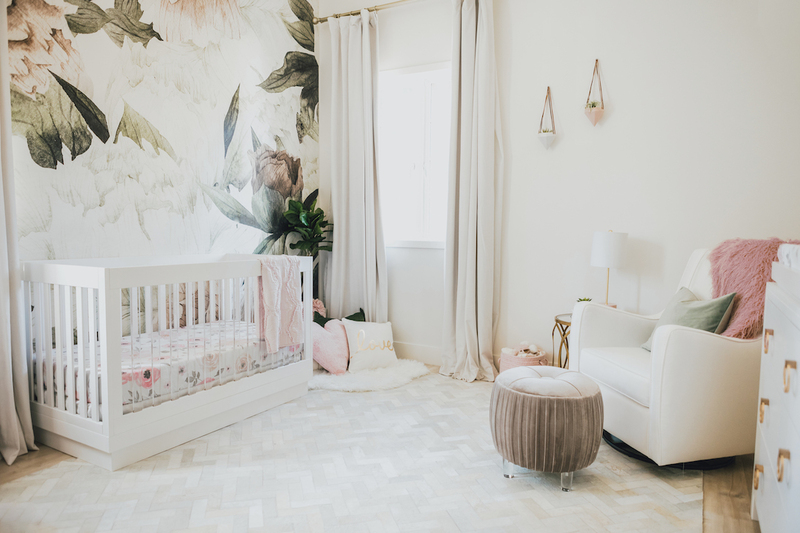 Crib skirts come in lots of different lengths and styles, and the mattress heights on your crib are not the same across brands. Plus, the crib skirt might fit just fine at first, but then when you drop the mattress down, it can drag on the floor. My recommendation is to get one that fits your crib with the mattress at the top, and then when you drop it down, you can kind of shove it under the mattress so it sits at the right length. You can also use fabric tape for this. In this floral nursery, the mattress is dropped to the bottom setting. There was still a little space under the mattress, so we put a crib skirt on to cover that. Crib is the Babyletto Harlow Crib. All crib mattresses, aside from oval, round, or specialty mini cribs, are the same size. You don’t have to worry about getting a certain size. Just “crib size”. But if you do buy oval, round or mini, make sure to get the coordinating mattress. The same goes for crib bedding. It’s all the same size, unless it’s a specialty shape. Keep the directions underneath the mattress so you don’t lose them. Register your crib so you will be notified if there are any safety recalls. Find out if your crib will take a skirt before you buy it. But, crib skirts are not essential. You may like the look without one! Decide if you want the conversion kit, and if you do, buy it at the same time as your crib in case it gets discontinued. Assemble the crib INSIDE the nursery. A lot of people make the mistake of assembling it in another room and then it won’t fit through the door. Keep any extra hardware and if it comes with a little allen wrench, keep that too. You’ll need it! If you have any other questions about cribs, please comment below!